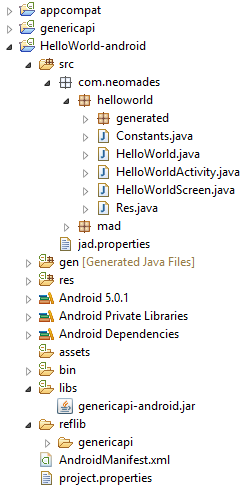 The Eclipse Android project generation is deprecated. This means that it is not supported and may be removed in a future version. 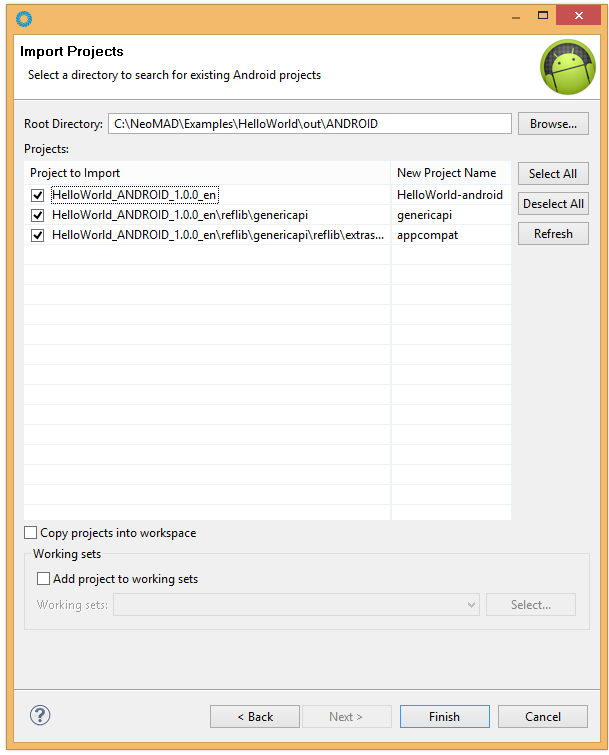 No prerequisites are needed to generate Android project files with NeoMAD. However, this guide assumes that the ADT Plugin for Eclipse is installed and that an Android Virtual Device (AVD) already exists in order to create, compile and run the Android project in Eclipse. Please refer to Android documentation for more information about Android Developer Tools. For this tutorial, the HelloWorld project (from the NeoMAD examples) will be used. It will be built for language 1: English. Right click on you Android project and select Run As -> Android Application. The application is compiled and launched on the emulator.